Whois the Bee Stand for? Who uses it? 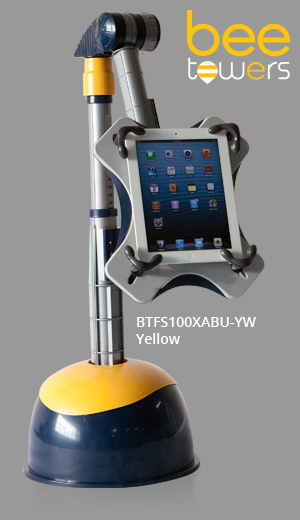 Bee Tower is a fully adjustable floor standing tablet stand with a telescoping Arm & Body that adjusts with the push of a button. It can rotate 360 degrees horizontally and 180 degrees vertically. It has fully rotatable Tablet Holder that can also flip 360 degrees and features a spring locking mechanism and a thickness adjustment. It can accommodate any tablet from 5″ to 11″. It’s great for business or personal use. Do you find your arms become tired holding your tablet in the desired viewing position? If you do, you are not alone. Fortunately, help is here. 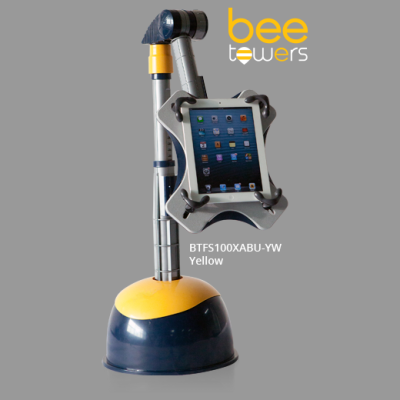 Bee Towers fully adjustable Tablet Holder eliminates the need to hold your tablet so you can spend time enjoying your tablet like never before. Use it anywhere in your home or office. Read, stream videos, watch movies, or surf the internet. Once you experience the convenience and versatility of a Bee Towers tablet holder, you will rarely go back to holding your tablet again. 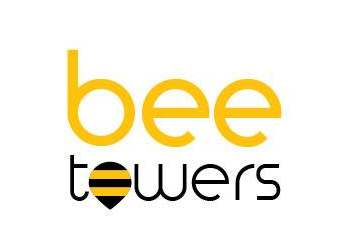 How is the Bee Tower different from other tablet stands? Its colorful, futuristic design, holder design comply to tab,push,slide tablet without oscillation. Great extension arm length for using on bed,couch. Flexibility position and sturdy base. It has 12 functions. #5.Telescoping body by a push of button let you adjust your desire height and automatically locks it to position when you release. #6. The arm length is also extendable by a push of button and serves you comfortably while you are on your bed or couch. #7.The arm comes with tension mechanism which let you tilt up and down 180deg. Was there an “ah ha” moment? Handheld devices such as tablets are increasing common in our lifestyle. Incorrect sitting posture and viewing angle with extended period of time may lead to wrist pain, stiffness in neck, back pain and even spinal deformation. The scenario will be even worst for kids. XAR Motion Pte Ltd was founded with our vision to reduce or eliminate those risks and change our perception on relying of table while using tablets. Additional with our ergonomic design, tablet owners will definitely have more joyful and extended moment with their tablets.